Nothing. I have nothing going on right now (except Butterman's head is trying to burrough under my pelvis in a painful, but seemingly unproductive manner). I am going to stop working tomorrow. My husband says I should take Friday off and make it a four day weekend. (I'm due Tuesday, September 4th)...how about making it a 4 month weekend? I think I am going to start my maternity leave Friday, regardless of whether Butterman feels the need to make an appearance or not. Law firms are bastions of political correctness are they not? There comes a time in every woman's reproductive life when she finds herself at a crossroads. That time is different for every woman. Some find themselves at that crossroads before the idea of pregnancy even hits. Some must stand there soon after finding out that something is growing inside. Each decision different, each decision personal. Each decision that woman's alone. To get a bikini wax, or to not get a bikini wax. Part of me thinks that of all the times you would like to be neat and trimmed, it would be the one time when a host of people will be in and around that area. The other part of me thinks that given the fact that a human being will be coming out, no one is really going to notice my new "haircut". It is my body, my decision. I made the appointment. In my defense, when I called, I informed the woman taking the appointment that I was 9 months pregnant and felt awkward. She assured me that tons of pregnant women do this, and I shouldn't think twice about it. This reassured me. Until I got there, and the waxist (waxicologist? waxer?) took one look at me and said she couldn't do it. Let's just say I felt like a monster at that point. And it only went downhill from there. Regardless, another woman came to take me back, and when we got back there, it was evident that I couldn't get onto the table. At that point, I felt like I was a deformed quasimoto. And no the table didn't have a lowering system like a massage table normally does. So this woman wanted me to jimmy sideways onto the table, while she hoisted my leg up. All while I was in my underwear. Yeah, I don't think so. I asked for a step stool. The best they could do was an overturned bucket. Great. This was clearly going to be luxurious! I have no idea why I thought it would be awkward! I eventually got on the table. I will spare you all the details, but let's just say I was in there forever, and she asked me several times how I thought it looked during the course of the procedure. Lady, if I could see beyond my girth to tell you what it looked like, I wouldn't be here in the first place. The thing about crossroads, once you start down the path, there is no turning back. So I sit here today, a neatly trimmed woman. And to all those that will follow in my footsteps, I can not tell you what to do. My place is only to relay my own experience for your consideration in making your own life decisions. It will be up to each one of you. Good luck and God's speed to you all. PS: You may want to bring your own step stool. WAIT! What was that pang? My life is so exciting, I often think a movie should be made...don't you? The pain and pressure in my pelvis was incredibly intense. And it would wax and wane. Finally, I said "I think I might be in labor." And his eyes went wide, and his face went pale. But I have to hand it to him, on the outside, he remained cool and collected. Then it occurred to me that I hadn't felt the baby move for about an hour and a half. I know a girl who knows a girl whose baby was suffocated inside her by the cord. So the not feeling Butterman thing-totally freaks me out. Do you think we should call? Ummmm...I don't know do you? After some debate, we called. The doctor said to come on down, in much the same way Bob Barker did on the Price is Right. Surprisingly, Bob Barker is not that reassuring of an impression to do when speaking to a pregnant woman. My husband stayed collected and packed our bag. I packed him some snacks and took a shower. His eyes stayed wide and his face stayed pale. I knew I probably wasn't in labor. I was just worried about not feeling Butterman. I kept repeating "Are you going to be mad?" He kept repeating "No." everything he said to me was in a sweet, soothing tone that calmed me down. He was being so understanding and nurturing. Within an hour, we were hooked up to a monitor where Butterman was passing with flying colors, moving all over the place, heart beating strong. The doctor told us everything was fine. "No, it's good we know the baby is okay. Do you feel better?" "Are you aggravated?" "Just a little?" "No. I figured you would have two false alarms. So we got one out of the way tonight!" "So what you are saying is 'I know my wife is a crazy overreacting pregnant woman?' Figures." That sweet, soothing tone? The understanding and nurturing manner? It's the same way people handle the crazy bag lady who has you cornered on the train...no sudden moves in front of the looney woman with ten coats on in 90 degree weather. I am taking a cue from Amalah and reeling you in with a picture! 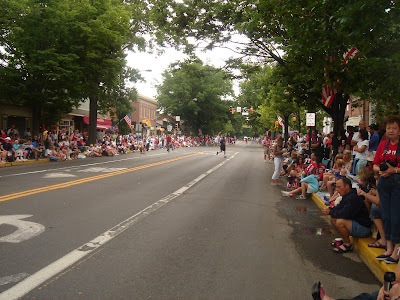 4th of July (waiting for the parade) in my town...almost worth the exorbitant taxes, don't you think? I really cranked out there for the past month, huh? The going got a little tough, and instead of the tough getting going, well...the tough (or not so tough) got bitchy. I blame it on the lack of sleep, really. Oh, and the heartburn. There is definitely more heartburn in the last month. And did I mention the braxton hicks or the fact that my back seizes up two or three times a day in the most painful 30 second intervals (the term "most painful" should be interpreted as a relative term as I have yet to do the actual labor...which I think might hurt a little...)? Also, I would love to be able to wear shoes, I really miss shoes. How quickly does the swelling go down? Basically, I am blaming this all on Butterman. Really though? I am going to miss this mess we call pregnancy. For most of the time, it was great. I felt great, my husband was infatuated with me, and truth be told, the whole thing made me feel kind of special in a way that nothing I have ever done before has. Allow me to be a total sap (which when you are pregnant, people give you leeway to do) and declare: I think this is the purpose of life...Butterman may be my calling. Someone alert OPRAH! Seriously, alert Oprah. And ask for tickets to the "my favorite things show." A girl could really use a cashmere Ralph Lauren V-Neck sweater for her and her dog. Wait. Where was I? Oh yeah, I am getting nervous about letting this Butterman out. I like him close. And although my husband feels like I have been pregnant for two years, lately it feels like the time has flown by. Butterman will be here before we know it. And our lives will change in ways I can't imagine or ever really know. But something tells me, it won't be too long before my husband and I are driving back from Harvard, all alone in the car...after having dropped off our first born. I will think back to these last moments of having him so close, so dependent on me, so little and wonderful and beautiful. It will not be lost on me that I have taken that very drive myself all these years, in the reverse, after having left home in Boston to go to school in Philadelphia; and I will understand what it must be like to be a parent. And I think in relative terms, that just might be "the most painful." WE INTERUPT THIS BLOG BREAK FOR BREAKING NEWS: A NEW BABY! Born at 4:26 am, August 9, 2007. *Picture credit to my sister-in-law who stayed by her sister's side THROUGH THE ENTIRE LABOR and snapped this with her cell phone a little after delivery! To the average person, this picture may look a little grainy. To my husband and I at 6 this morning, opening it on our blackberries and getting our first glimpse through glassy eyed tears...it was the most beautiful picture ever taken. Honestly, I think I am too pregnant to blog. The last week has been extremely hard. I am waaaaay too stressed and emotional, and mainly, I am waaaaaaay too tired. Sleeping in the last month of pregnancy is ridiculous. I have been cranky, but worse than that, I have been pretending not to be cranky for the sake of those around me. And so, I turned to you, dear internets...and in an attempt to sheild those around me in real life, let off steam. I exposed you to the crank the other day. Not fair, I know. And I felt bad about doing it. No, that's a lie, I didn't. I didn't think it was a big deal to vent on my own blog. So I exposed you all to the crank and then went about my business, never once thinking of how it would impact you. Then I got the negative comment, telling me how out of line and harsh I was, and how my husband must be afraid of me. So I have to take a break. I think it's time, don't you? God, I disgust even myself at this point, so I am going to spare you the ugly finish to this pregnancy.